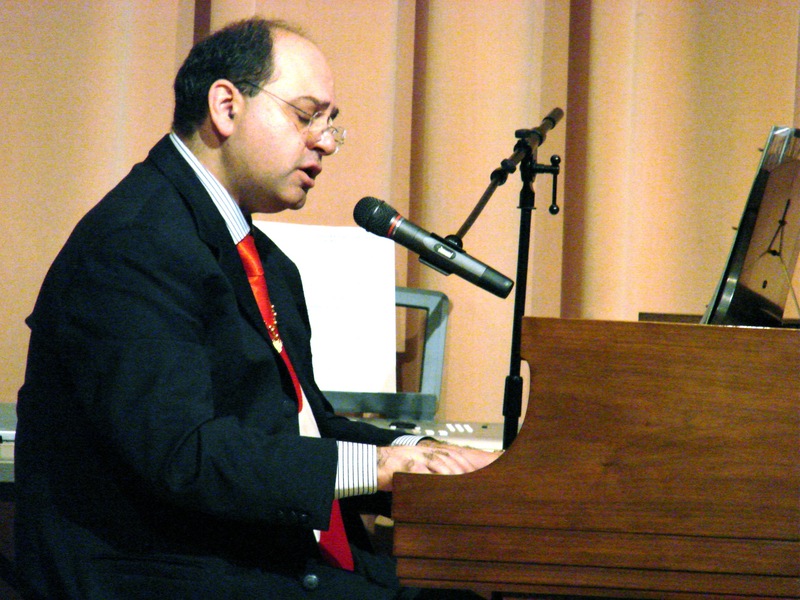 On November 17, from noon to 1:00 pm, A Little Lunch Music will present a free concert featuring Marc Karam and Friends. Joined by a trio of jazz musicians, Marc will sing well-known standards from France, Italy, Spain, Lebanon, and Egypt. English versions of some of the songs, like “Les Feuilles Mortes” (“Autumn Leaves”) and “La Mer” (“Somewhere Beyond The Sea”), became hits in the United States. The concert will be in the Auditorium. Thanks to Leslie Swartz for helping to make this performance possible. The concert will be in the Auditorium. A gift from Leslie Swartz helped to make this performance possible. Karam said he is a frequent performer in church settings. Twice a year, he likes to join with a group of friends to present a concert of sacred music. They perform traditional pieces, modern pop, and even Gregorian and Byzantine chant. Karam said he loves performing with these friends. “We have an amazing range of styles,” he said. “I always like to present a program of diversity,” he added, saying that diversity is something he has loved about American culture since he moved here to study 24 years ago. That tendency toward diversity and trying new things carries over into his secular music as well. Thursday’s concert will be his first full concert with jazz musicians. It will include what Karam calls “international classics.” Many of these songs that originated in Europe, like “Les Feuilles Mortes” (“Autumn Leaves”) and “La Mer” (“Somewhere Beyond The Sea”), became English-language hits. Others, like “Save the Last Dance for Me,” were composed in the US and became translated hits in France. Karam will sing in French, English, Italian, Spanish, and Arabic. He is from Lebanon which historically has had strong ties to France. He said he learned his love of the French classics from his uncle. He will also sing well-known songs from Lebanon and Egypt. The trio of jazz musicians will be composed of guitarist Taylor Pierce, bassist Jason DeBlanc, and saxophonist Patrick McCurry, who also coordinates A Little Lunch Music. Most of Karam’s performances, whether in church or on stage, have been as a soloist while he accompanies himself on piano, but said he doesn’t like to get in a rut. “I like not to always do the same thing over and over,” he said. The first time Karam worked with a jazz trio was at his A Little Lunch Music concert in November 2015. It was only for a short part of the program, but was very well received. He wanted to explore the ensemble more deeply. In May, he presented a concert at the Alabama Shakespeare Festival with Montgomery-based jazz musicians. Thursday’s concert will be with the original Auburn trio from last year. Performers will be Patrick McCurry on sax, Taylor Pierce on guitar, and Jason DeBlanc on bass. “It helps me focus on the singing,” said Karam about performing with a trio like this. He said not playing the piano helps him to enjoy the singing more, but requires a different kind of coordination among the players. “In the end it is beautiful,” he said. Karam doesn’t consider himself a jazz musician. But he enjoys combining his classic style of singing the melody with the improvisation brought by the others in the group. “I love the solos. That fascinates me,” he said.